While traveling to the dying king s bedside to offer his medical expertise, Nikolai is set upon by a bandit. Reaching the king s ancient stronghold, he discovers his mysterious brigand is the beautiful, arrogant Prince Aleksey. Aleksey is everything Nikolai is not: unguarded, passionate, and willful. Despite their differences, Nikolai feels an irresistible desire for the young royal that keeps him in Aleksey s thrall. But Hesse-Davia is a dangerous world for a newly crowned king who wants to reform his country and for the man who loves him." This book is unlike anything I have ever read, it is unpredictable with great world building. 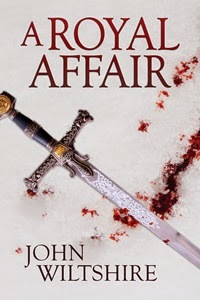 A Royal Affair is set in a middle European world called Hessa-Davia, which is cruel and seems more medival than Nikola Hartmann is used to. I read an except on my kindle, and was instantly hooked and bought it in paperback, what a brilliant decision!! At first Niko could be seen as being a the lone grumpy healer, while Aleksey could be seen as a spoiled prince. However the sexual tension between the two kept me reading on tenterhooks till the end. I always enjoy a slow build in a relationship and these two danced around their feelings for a while until finally they understood each other. The best part was that they both grew together until you couldn't imagine the one without the other. The style of writing that Wiltshire uses is different from anything else I have read, as foreshadowing and speaking directly to the reader is a technique Wiltshire uses freely. Overall the book was thrilling and emotional with a solid plot that did keep me feverishly reading. However I found the ending a little rushed. Yet I feel I need to re-read the novel to see if my criticism is valid, but I felt the build to the climax of the story was over far too quickly, with no room to mourn the tragedy. Overall however I would give this novel a 3.5 Stars, and would recommend it to people who love tragic fairy tales and betrayed princes. I am now a John Wiltshire fan and apparently their is a sequel to this novel.